won the Gran Prix prize in 2012 (cartridge division) of the Stereo Sound magazine, the most authoritative audio magazine in Japan. When very experienced critics agree on the high quality of a product, this surely inspires confidence. 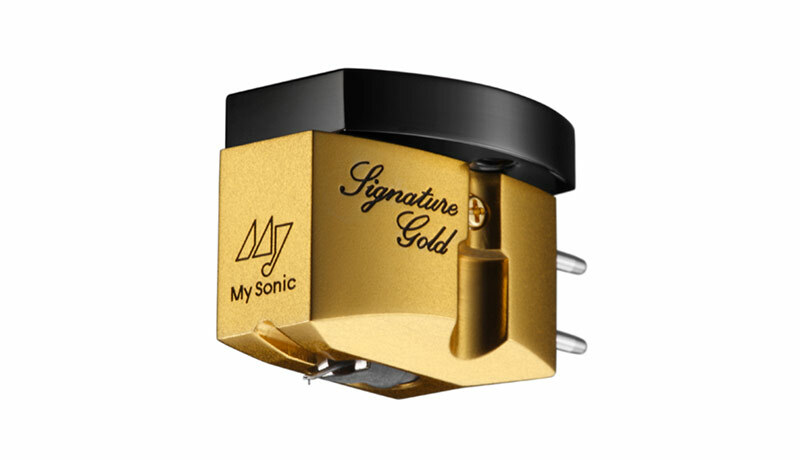 In terms of construction the MSL Signature Gold damper system has been updated, with a larger core creating a generator with a much higher efficiency. It is a step up from the Ultra Eminent with improved sonic qualities presenting outstanding dynamics, naturalness, transparency because of it’s ability to extract the huge amount of information that lays within the vinyl surface thus imbuing the listener with an emotional connection to the music. SH-µX core having intrinsic ultra Hi-Bs & Hi-µ: An astounding high-efficiency output 0.5mV with 1.4O ohm internal impedance was created thanks to the elaborate high-efficiency magnetic circuitry composed of their exclusive core with minimal windings of the coil wire. Semi-line contact stylus: Outstanding trackability, without tracking distortion by means of microscopic 0.1mm-square diamond tip of 3 x 30µmm semi-line contact. The hyper-solid duralmin base makes the cartridge totally variation-proof and free from resonances. Dramatically reinforced magnetism was obtained by means of a refined core whose cross-sectional dimensions are enlarged by as much as 10%, compared to the current versions, at the cross-sectional dimensions.